KW Coilovers for the F10 5 Series are for the enthusiast who is serious about lowering their vehicle with the highest quality system. Not only are the F10 KW Coilovers high quality, they include a lifetime warranty for piece of mind. These coilovers are available in 3 variants, V1, V2, and V3, see below to determine which ones suits your needs the best. 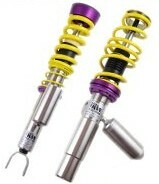 Lower your 2010+ F10 5 Series with the best suspension system on the market, KW Coilovers. 528i/535i/550i EXCEPT Adaptive Drive 1.0"-2.2" 0.8"-2.0"
528i/535i/550i EXCEPT Adaptive Drive (includes EDC Delete unit) 1.0"-2.2" 0.8"-2.0"
The KW V3 Coilovers for the F10 5 Series feature all of the features of the V1 and V2 with the added benefit of adjustable compression rebound dampening for the experienced driver. KW V3 F10 Coilovers are specifically designed the experienced driver.